Let’s go claustrum-hunting – The brain is sooooo cool! 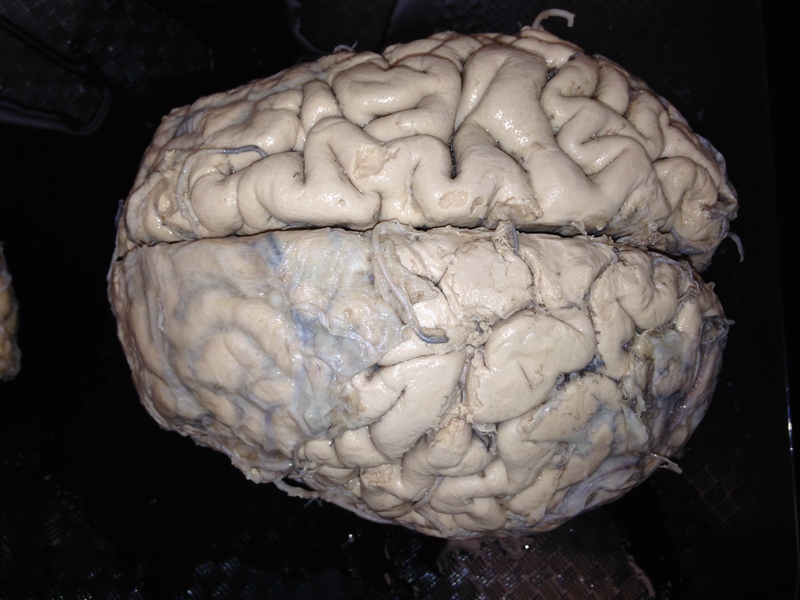 A picture of a human brain with cuts in the horizontal (ok, the almost horizontal) plane. In this edition of Lab Videos, we look at horizontal cuts through the human brain. By slicing through the brain, we are able to see all the interesting territory that is normally hidden by the bark or cortex (yes, the word cortex derives from the Latin word for bark; and I am referring to the tree version of bark rather than the dog version) of the brain. If you want some background on the structures discussed in the video, continue reading. And of course, feel free to go back and forth. If you already know the body planes and directions, skip down to The cerebral hemispheres. When we slice the brain, we can do so in any plane. The three normalized planes of the body are coronal, horizontal (aka axial in clinical imaging terms), and sagittal. The coronal plane is the plane of a tiara and it separates forward regions from regions in the back. The horizontal plane is the plane of the horizon (in an upright individual). It separates top from bottom. The sagittal plane is the plane of a Mohawk hairdo. The sagittal plane in the middle of the head, termed mid-sagittal, separates left and right. These terms have the same meaning in all parts of the nervous system in virtually all animals. But humans, along with a few others such as kangaroos, are different because of that right turn that the nervous system took in support of bipedalism. In quadrupeds, the undersides of the body and face are in parallel planes but in bipeds, the underside of the body is in a vertical plane and the lower jaw in a horizontal plane. Why do I go on about this? 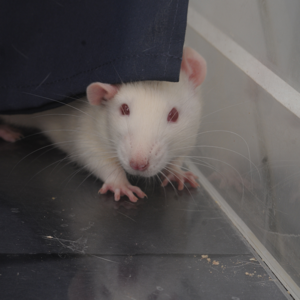 Well, think about the contrast between a rat and a human. In the rat, the coronal plane is transverse (or orthogonal) with respect to the axis of the central nervous system, at all levels. Further, rostral and anterior are synonymous just as caudal and posterior are, and these equivalencies hold true throughout the central nervous system. Now consider a human. For the spinal cord of a human, our underside is in front and our back is “coming after” or in back. Thus, for the human spinal cord, ventral is anterior and dorsal is posterior. This biped-quadruped difference has linguistic implications with clinicians’ employing anterior-posterior terminology within the spinal cord and basic scientists’ employing dorsal-ventral terminology. Thus dorsal or posterior columns and ventral or anterior horns are clinical-basic versions of ta-may-toe vs ta-mah-toe. 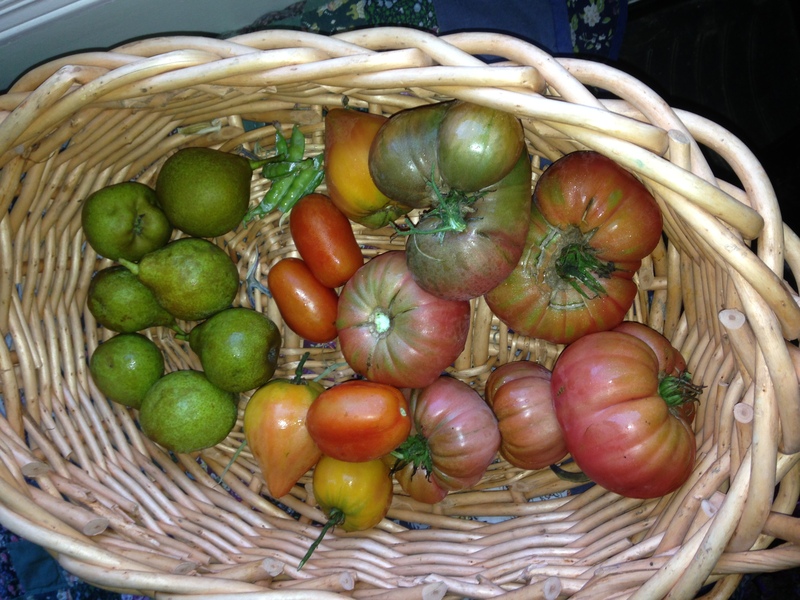 A gratuitous exhibition of late season heirloom tomatoes from the author’s garden. Sagittal slices are really fun to look at, highly informative and also quite challenging particularly for the novice to neuroanatomy. Coronal slices are the most commonly presented view and we’ll look at the brain in coronal slices in a future lab video. I chose to start with horizontal slices because they are both challenging and accessible. I hope that, with some help from me, you can use this tour of horizontal sections to synthesize your 3-dimensional understanding of brain anatomy. So let’s get started. A top down view of the human brain shows the two cerebral hemispheres which are not joined except at the corpus callosum, which is only present at the ventral margin of the medial hemispheres. We will examine horizontal slices of the brain starting at the top and working our way down. The first thing that you may notice is that the two cerebral hemispheres come off as two separate pieces; they are not joined. In fact, the cerebral hemispheres only become joined more ventrally, by the corpus callosum. In horizontal sections through the corpus callosum, axons streaming in parallel, left to right and right to left, are evident even to the naked eye. Awesome, don’t you think? The cerebral cortex, evident as an outer rind of gray matter, has a modular pattern with different cortical fields primarily concerned with different functions. This modularity is most obvious in the major primary cortices: somatosensory, auditory, visual and motor. Primary sensory cortices are necessary but not sufficient for normal perception. So, visual input to primary visual cortex arrives from the retina, after translation into cortex-ese by the thalamus, and supports visual perception. Many mammals, including humans, are highly visual animals, meaning that vision is the primary sensory modality used to navigate in the world. Corresponding to this, the tract of axons that carry visual information to the primary visual cortex (from the thalamus) is so large that it is easily viewed without magnification. This tract is called the optic radiation. The destination of the optic radiation is the primary visual cortex, also called V1, which is present along the calcarine fissure (also termed the calcarine sulcus), which adorns the medial surface of the occipital lobe. In the cortex of V1, there is a thin white line called the Stripe (or stria or line) of Gennari. This stripe, visible to the naked eye, was discovered in 1776 by an Italian medical student, Francesco Gennari, after whom it is named in glorious perpetuity. Seeing this stripe using the simplest of tools – my eyes, a knife, and an unstained brain – connects me with the great anatomists of yore and gives me an enormous kick. Take note, all of you students: there are still opportunities for low tech’ discoveries. Be clever and be observant! 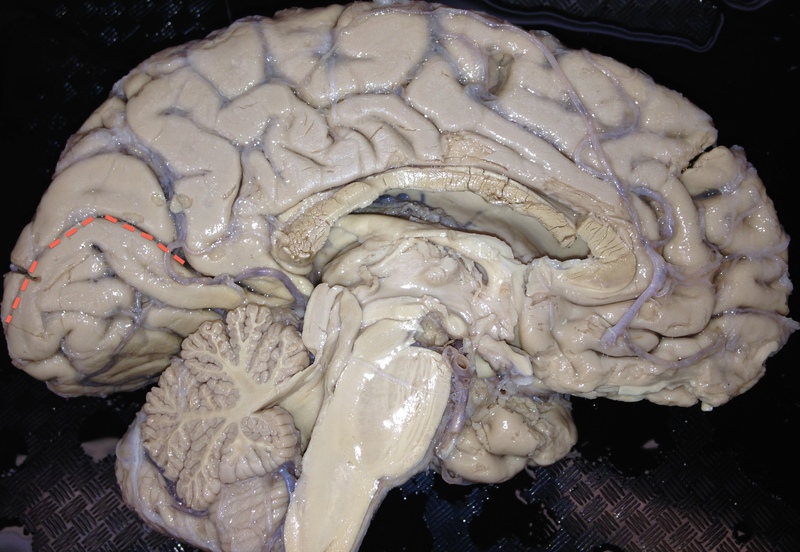 The calcarine sulcus is marked by a dashed red line on this image of the medial surface of the cortex. The upper bank of the visual cortex carries information about the lower half of the contralateral (other side) visual world and the lower bank of the visual cortex carries information about the upper half of the contralateral visual world. When the developing telencephalon (see below) invaginates along the midline to form two hemispheres, the lumen of the developing neural tube splits into two spaces that will become the adult lateral ventricles. Only if you want to know: The term telencephalon refers to the front end of the forebrain. The forebrain derives from a swelling or vesicle called the prosencephalon. 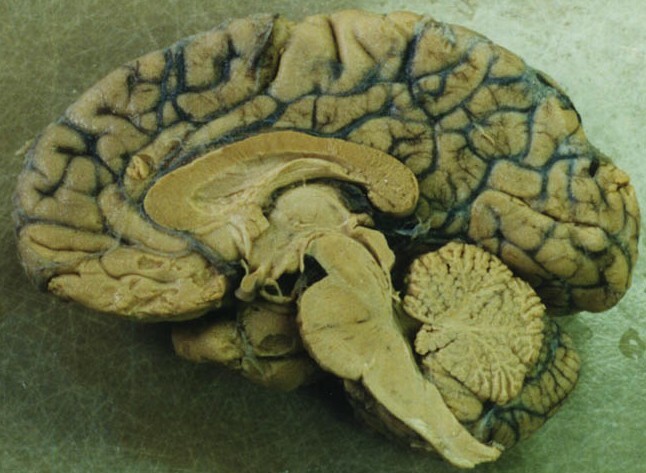 A few days after its formation, the prosencephalon divides into two daughter vesicles: the telencephalon and the diencephalon. The telencephalon will become the cerebral cortes, the core components of the basal ganglia (namely the striatum and pallidum), and the amygdala (oh and the claustrum too…). The diencephalon will become the thalamus and hypothalamus. As the cerebral hemispheres expand to accommodate ever so much cortex, the lateral ventricles expand in parallel. The hemisphere expand by arcing around in a ram’s horn shape. And so do the lateral ventricles. In this lab video, we start by cutting a slice off the top of the ram’s horn. So our first glance of the ventricle is one of “looking up at the roof.” Along the edge of the lateral ventricles, choroid plexus is present. Choroid plexus filters blood into cerebrospinal fluid or CSF which fills the ventricles and then leaks out to fill the subarachnoid space surrounding the brain and spinal cord. I thank my pillow of CSF every day for saving me from knocking my brain around as you go about my daily business. Just as the lateral ventricles follow a ram’s horn-shape, so does the caudate. The caudate is a core part of the basal ganglia. Together with the putamen, the caudate forms the striatum. The caudate wings around the lateral ventricles and consists of a head most anteriorly, a sizeable body, and then a diminishing tail within the temporal love. 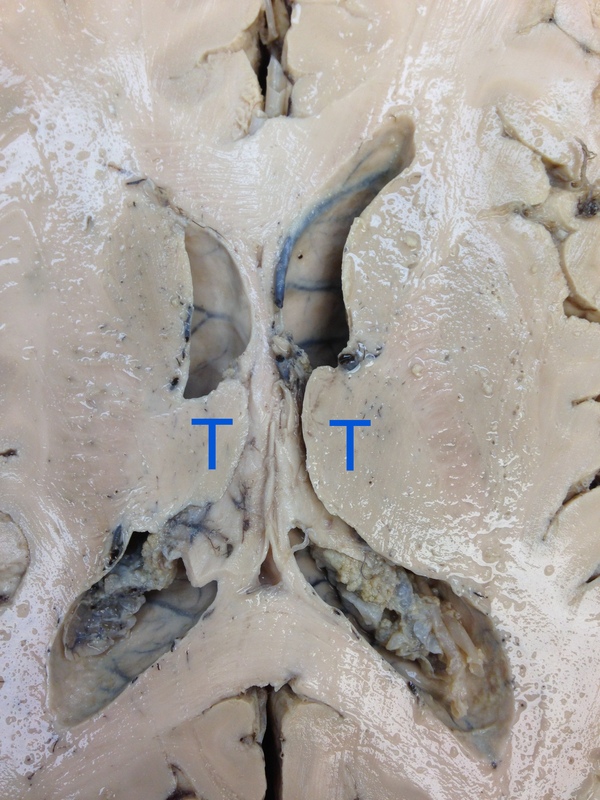 As we dive deeper inside the telencephalon, we see the putamen from which the caudate is separated by the internal capsule. The internal capsule contains axons coming from the cerebral cortex destined for the brainstem and spinal cord. During development, the internal capsule divides the caudate from its twin, the putamen, both of which derive from the ganglionic eminences at the base of the developing telencephalon. The term basal ganglia derives from the striatum’s (and globus pallidus’) embryonic origin from the basal ganglionic eminences. The diencephalon, containing the thalamus and hypothalamus, appears to me cowering within the blustering, ever expansive telencephalon that appears forever seeking new territory. 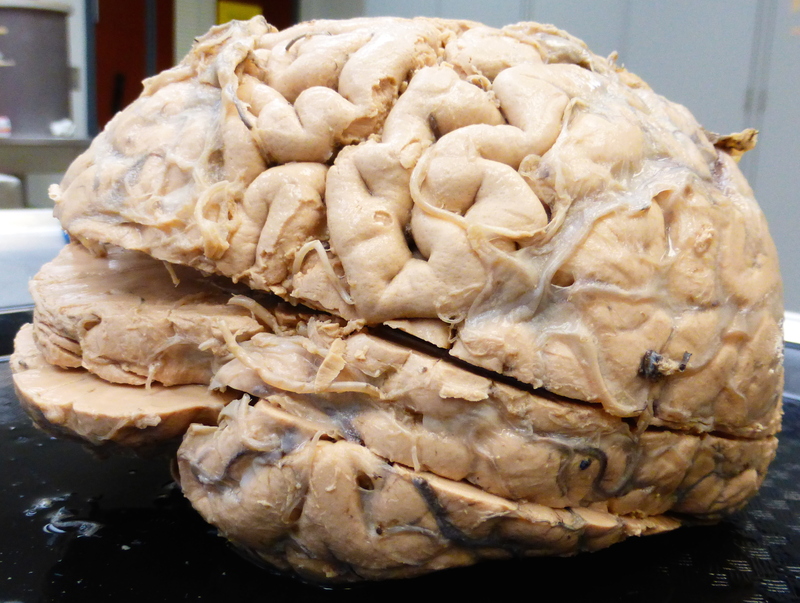 Mammal to mammal, and vertebrate to vertebrate, the diencephalon maintains its modest size. I admire the thalamus for accomplishing its tasks with a parsimonious use of space. This is a horizontal section through the thalamus (T). In this image, up is anterior. Many other structures are also visible, including the lateral ventricles, choroid plexus, caudate, internal capsule, corpus calossum and more. The gray matter on either side of the third ventricle is thalamus and hypothalamus. The lateral boundary of the diencephalon is the internal capsule, which is the physical join between the di- and tele-encephalon. In other words, if it weren’t for the internal capsule on either side, the telencephalic hemispheres would hang off, like dog ears, off either side of the diencephalic face. 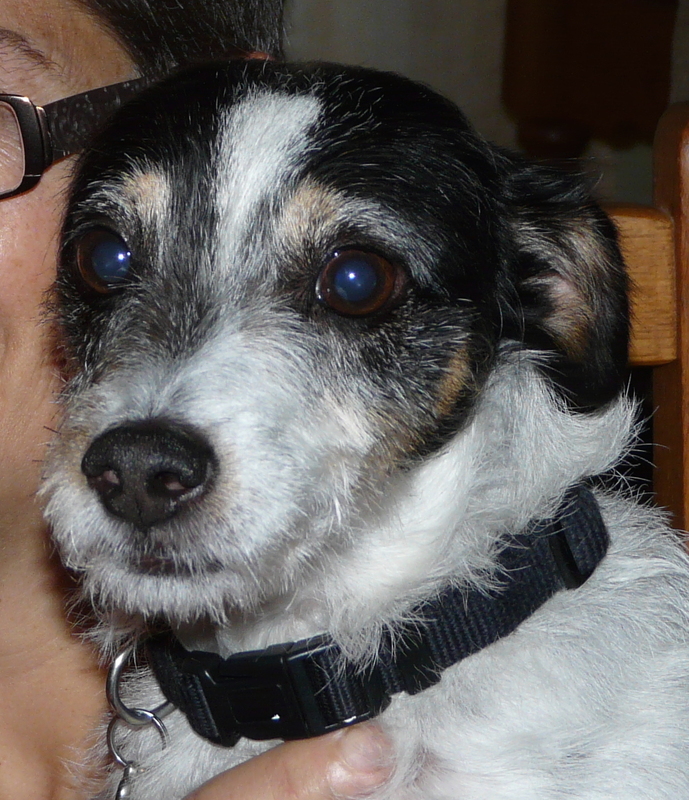 Just a shameless excuse to show cute Bam-Bam with his floppy ears. The term internal capsule suggests the existence of an external capsule and indeed there is just such a structure. External to the putamen is a thin white tract called the external capsule. And just outside the external capsule is a thin island of gray matter called the claustrum, of recent fame (see below). Finally, sandwiched between the claustrum and the superficially located cortex is another white matter tract called the extreme capsule. Recently the claustrum has been in the news. Mohamad Koubeissi and colleagues from George Washington University were studying a patient with epilepsy. This patient had had surgery, years earlier, to take out an epileptic seizure focus (the place where a seizure starts) but, unfortunately, was experiencing seizures again. To locate the focus of the new seizures, the neurosurgeons stimulated in the brain while the patient remained awake. Neurosurgery is typically done on awake patients so that disruptive regions can be identified. The patients can report sensations or urges to move that are produced by stimulaton. Most importantly, the patients are asked to talk so that regions where stimulation results in disrupted speech can be identified. In this manner, neurosurgeons can avoid removing areas involved in speech. By chance the neurosurgeons stimulated in the claustrum. They reported that stimulation “resulted in immediate impairment of consciousness, in 10 out of 10 times, with arrest of reading, onset of blank staring, unresponsiveness to auditory or visual commands, and slowing of spontaneous respiratory movements. The patient returned to baseline as soon as the stimulation stopped with no recollection of the events during the stimulation period” (Koubeissi et al 2014: Epilepsy & Behavior 37:32–35). They concluded that “the claustrum – a region in which the effects of electrical stimulations have never been reported to our knowledge in humans – could be a key component of the network supporting ‘conscious awareness’”. This is the only report of this finding and whether the authors’ interpretation that the claustrum is consciousness’ on-off switch becomes accepted, remains to be seen. The hippocampus is a region of three layered cerebral cortex. We learned from the famous patient HM that the hippocampus is necessary for forming explicit memories. The hippocampus curls around the medial wall of the telencephalon and is largest in the temporal lobe where it nearly borders the lateral ventricle. However, hippocampal cortex is separated from the ventricle by a thin white matter tract called the fimbria. The fimbria grows into a larger white matter tract called the fornix. The fimbria-fornix follows the arc of the lateral ventricle, connecting the hippocampus with the medial thalamus and the mammillary bodies. You can actually see the fornix arcing around the lateral ventricles in the picture of the thalamus above. A new MOOC starts 2/23/15. I think that combined with the MOOC, watching the lab videos here on my blog, in order, should get you up to speed. 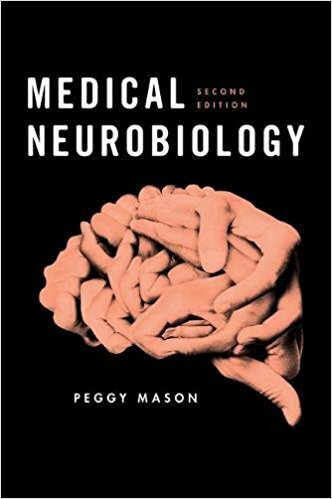 Is it possible to take you on on that ‘ I can’t think of a neuroanatomical term that I don’t have feelings about’ :)? It is suprisingly complex for such an ancient part, what other structure beside cerebral cortex has layered design? There is a theory that it is colliculus that mediates the peculiar unconscious ‘vision’ in people with bilateral visual cortex lesions called ‘blindsight’. Sorry for the very late reply to your interesting comment. I agree with you that the SC is fairly spectacular. I was just thinking about the SC because I was looking at a book of fish brains. [This was motivated by my flounder encounter….] What I realized is that there is from back to front, as you look down on the ye olde average fish brain, medulla, cerebellum (overlying and completely obscuring pons), SUPERIOR COLLICULUS, and then olfactory bulbs. The latter are essentially the only visible (from the top) telencephalic derivatives. I could not see thalamus from this view. What this has led me to think about is that the sheep is not weird with its large SC. We are weird with our small SC. I am going to think more on this and explore further but that is where I am right now. I will leave consciousness to you. Great video. Thanks for the detailed analysis of the horizontally sectioned brain. Has there been any more development in understanding the functions of the claustrum?